Marietta City Hall is located at 205 Lawrence Street, Marietta GA 30060; phone: 770-794-5526. 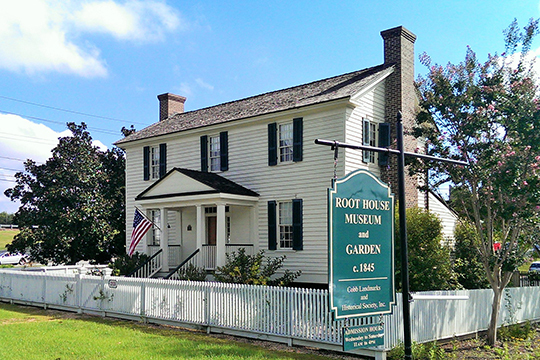 Photo: William and Hannah Root House, ca. 1845, 145 Denmead Street, NW, Marietta, GA. Listed on the National Register of Historic Places in 2014. Photographed by User:RudyTravis (own work), 2014, [cc-by-3.0 (creativecommons.org/licenses/by/3.0)], via Wikimedia Commons, accessed April, 2016. Marietta, Cobb County seat of government, was incorporated in 1834. Historians do not agree on how the city was named. Some believe it was named in honor of Mary, the wife of Thomas Willis Cobb [1784-1830], for whom the county was named. Cobb served both as a U.S. Congressman and Senator. Marietta  is an older historic city and is actually one of the oldest settlements in the Atlanta area. Marietta existed prior to both Atlanta and Chattanooga. The first reported settlements in what is now Marietta were a small cluster of homes near the Cherokee town of Kennesaw in the early 1820's. This cluster of homes has grown into what it is today the culturally diverse hub of Marietta that includes the downtown square, a vibrant residential community, and commercial establishments. As the county seat of suburban Cobb County, in the sprawling metropolis of Atlanta, Marietta offers its residents and visitors beautiful parks, quaint streets, Victorian homes and historic sites, and its companies and merchants an excellent locale for their businesses. In order for the City of Marietta to stay the course and maintain a high quality of life for its residents and its desirability for businesses, the City must understand where it has come from, where it is currently, and where it wishes to go in the future. City of Marietta, Georgia, Department of Development Services, Planning and Zoning Division Comprehensive Plan 2006-2030, 2006, www.mariettaga.gov, accessed April, 2016.